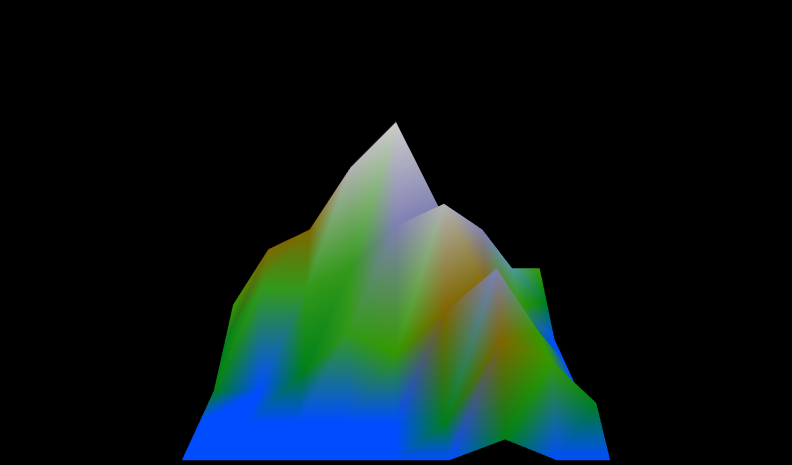 The Color node lists Red-Green-Blue (RGB) colors to use for rendering points in a geometric shape. Color indexes select colors to use at each vertex. Colors override any accompanying Material node. The colorPerVertex field selects color per line/face/grid square or else color per coordinate. Figure 16 1 Colored Point Set Scatter Plot A scatter plot with the points colored using colors from a Color node. Figure 16 2 Colored Lines Plot A line plot with the polylines colored using colors from a Color node. Figure 16 3 Colored Lines Starburst A star burst of lines colored using colors from a Color node, select second viewpoint for animation. Figure 16 3 Colored Lines Starburst With Axes A line plot with the polylines colored using colors from a ColorNode. Figure 16 4 Colored Book Faces A book with its faces individually colored using colors from a ColorNode. Figure 16 4 Colored Book Faces With Axes A book with its faces individually colored using colors from a Color node. Figure 16 5 Log Fire Colored Faces A log and fire using faces colored vertex-by-vertex with colors from a ColorNode. Figure 16 5 Log Fire Colored Faces With Axes A log and fire using faces colored vertex-by-vertex with colors from a Color node. Figure 16 6 Colored Elevation Grid Checkerboard A checkerboard built using elevation-grid squares and colored using colors from a Color node.